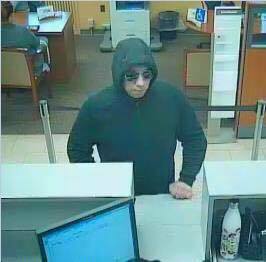 On January 24, 2018 at approximately 4:10 p.m. the Wells Fargo Bank at 273 West White Horse Pike in the Pomona section of Galloway Township was robbed. The suspect entered the bank and gave the teller a note. He then fled on foot from the bank running northbound on Pomona Road. No weapons were observed during the incident. The male is described as a white male, medium build, approximately 5’8” to 5’10” in his late 20’s or early 30’s. He was wearing a black hooded sweatshirt with grey sweatpants and running sneakers. The suspect fled with an undisclosed amount of cash. The investigation is being conducted by Detective Kerry Baerman of the Galloway Township Police Department as well as the FBI, Northfield Office. The Hamilton Twp Police Department K-9 unit and the Stockton University Police Department also assisted in the investigation. Anyone with any information can call the Galloway Township Police Department at (609) 652-3705 ext. 320. Tips may also be left anonymously through Atlantic County Crime Stoppers at (609) 652-1234 or through the Galloway Township Facebook page.